Because Metal is in our DNA! WEC Group has founded a brand new metal profiling and processing company as a way of strengthening operations at its Rotherham-based division, MTL Advanced. DNA Metalwork is operating as a new subsidiary of MTL at its 300,000 sq. ft. Grange Lane facility, providing subcontract profiling and sheet metalwork services to a broad range of industries. Specialising in laser, plasma, waterjet and flame cutting as well as fabrication, CNC machining, press braking, shot blasting, powder coating and wet painting, DNA Metalwork complements the Group's existing engineering divisions and improves our overall competitiveness. The new venture will enable the company to grow their customer base and reach new markets. Jamie Sharp, Managing Director of DNA Metalwork is looking forward to what the future holds as a company. He said: "I am very excited and proud to join an organisation that has experienced such rapid growth over the last 10 years. "DNA Metalwork is designed to give a fast response service to customers, and our initial key priority is to utilise the excellent assets that are within MTL's Rotherham site, as well as the many other state-of-the-art facilities which are available across the Group." DNA Metalwork has access to WEC Group's extensive in-house profiling capacity which includes 21 flat bed laser cutters, 2 tube laser machines, 1 robotic plasma tube cutter, 4 waterjet cutting machines and 23 press brakes, meaning it is already well placed to meet any metalworking requirement. In addition, the company has 40+ CNC machining centres and 12 robotic welding cells working around the clock, enabling DNA Metalwork to offer a true one-stop-shop service and adding further value to customers. The creation of DNA Metalwork means WEC Group now has fifteen specialist engineering divisions working across 600,000 sq. ft. of manufacturing facilities in Lancashire, Merseyside, Yorkshire and the West Midlands. 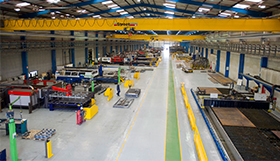 Following the multi-million pound acquisitions of Coventry-based HTA Group and Submarine Manufacturing & Products in May 2016, the Group is now able to offer an extended range of services to customers including CNC punching and the manufacture of commercial diving equipment and hyperbaric chambers. Please visit the DNA Metalwork website to learn more.